Two servings of first class musical mastery and each one different. One was musical show that was demanding for its audience, where only informed listeners perceived it as a reminder of tragic events. And the second was a lighter dance-like evening with songs that could be sung by the whole of the hall at the Sono Centre. 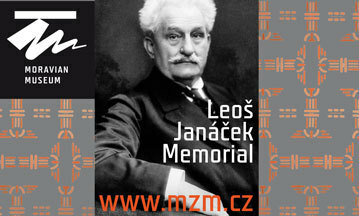 The organisers of JazzFest Brno have shown that no two jazz quintets are alike. Both of the leaders in the last two concerts of this year’s festival rightly got the stormy applause they deserved. At the same time you could hardly see on stage two such different musicians as Terence Blanchard and Richard Bona. It was down to chance that in both cases the hall of Sono Centre was filled by a quintet with the line-up of trumpet, keyboards, guitar, bass guitar and drums. 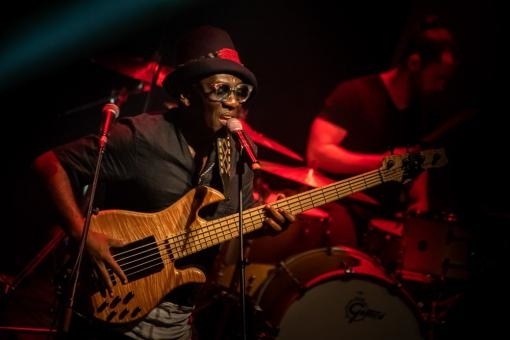 In one case the frontman was a trumpeter from the cradle of jazz in New Orleans, while in the other he was a bass guitarist who as a little boy played in his home village in Cameroon on the balafon and came to jazz via African music. However this is not the main difference between Blanchard and Bona. The first off them presented himself to Brno as a taciturn master, speaking virtually only through various distorted tones on his trumpet, or at times with the aid off his laptop keyboard. He only greeted his audience, which had listened closely to his demanding works that were fifteen minutes or more long, after an hour and a half. Conversely Bona presented himself like a comic, playing with the word BRRRRno (on a personal note: I once found myself with this exceptional bass guitarist on the same flight; I managed to grab a few words with him while we were still at the airport, praising him for one of the previous Brno concerts and even then while still in the plane Bona rattled out BRRRRno several times), warned against the mafia (concerning his Italian colleague Ciro Manna), expressed surprise that Brno’s inhabitants preferred his concert over church and sang with his grateful audience the folk song Vyletěla holubička ze skály. 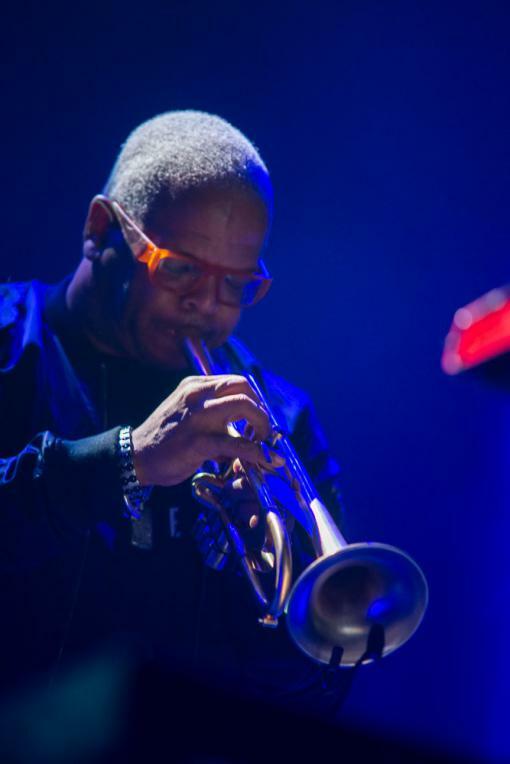 Terence Blanchard has dedicated two albums with his current group the E-Collective on the theme of violence in today’s United States. This year’s CD Live was even recorded in places where police “accidentally” killed innocent Afro-Americans or where dark-skinned policemen died during unrest. He does not draw attention to this theme (as depicted in the author’s article from a telephone interview) directly during concerts, but rather in gatherings, interviews or videos. Bona also has his big themes (in an interview for us he complained about how African radio stations seldom broadcast songs in traditional languages), but he has no desire to fight (“After all I wasn’t born to fight. I was born to live. Who should I fight against? I want to live in peace with others, I want to share with them,” he says). While Blanchard’s current works are essentially activist and militant (especially to those who know the context well), Bona wants above all to entertain. Of course the proficiency with which he combines African, Cuban, Indian and American music evokes peace and sharing with others, and so is actually also an activist. In truth Blanchard and Bona mirror our times, and even though they use different means and forms, the aim – peaceful coexistence between races r nations – is essentially the same. Both concerts were of course exceptional even when the listener took no notice of the already mentioned context, or was ignorant of it. Blanchard’s energetic and in places deliberately “dirty” playing on the trumpet from the first piece Hannibal competed with several keyboard instruments and especially with the solo electric guitar of Charles Altura. 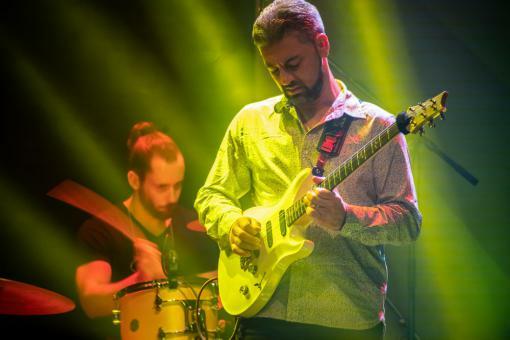 On the other hand Bona’s guitarist Ciro Manna in the first two pieces stayed in the background, but took a full part in the hit Please Don’t Stop. Bona also used as a “supplement” to his masterly bass the keyboard of his colleague Michael Le Coq and an absolutely crucial instrument also in the case of his group was the trumpet of the Cuban Dennis Hernandez, who at times sounded almost like a whole wind section. While Blanchard’s concert was based entirely on abstract musical language, supported by the play of lighting, and worked with long pieces as well as fragmented passages, Bona did not present himself only as a virtuoso bass guitarist but also as a singer able to cover several vocal registers. Blanchard’s E-Collective was a great celebration of electric and electronic jazz, with Bona in contrast also drawing attention with purely vocal numbers using a looper. Both these November concerts had much in common (and not just the line-up of five instruments), but at the same time offered almost opposite perspectives on contemporary jazz with forays into other genres. Both presented significant bandleaders, but at the same time had important roles for sidemen. Both concerts showed that contemporary jazz extends beyond the sphere of music. And they also show that top-level jazz is at home in Brno and musicians from the first division also feel at home there. 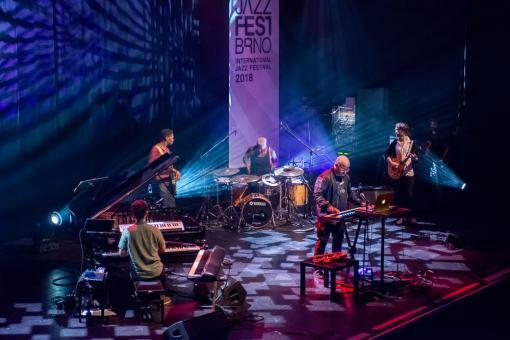 JazzFestBrno, last two concerts of 2018: Terence Blanchard & the E-Colletive (Sono Centre, 23/11/2018); Richard Bona Group (Sono Centre, 25/11/2018).